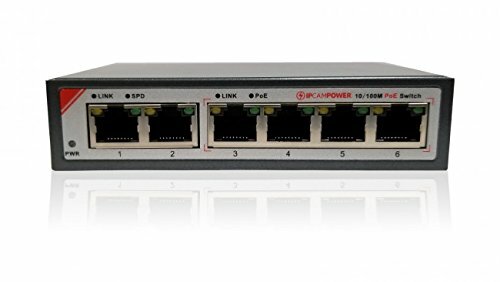 The IPCamPower 4 port POE switch is perfect for small IP systems or anything else that utilizes POE. The switch boasts 6 ports in all, 4 of which are powered, and 2 uplinks which are non-powered. The Powered POE ports are rated up to 30 watts each to push the most power hungry of devices. The switches total budget is 65 watts. Small low profile design will fit anywhere. 6 PORTS TOTAL, 4 POE PORTS, 2 UPLINK PORTS - The switch has (4) 10/100 powered POE ports with 2 additional non-powered 10/100 Ports. In a typical 4 camera system, your cameras would plug into the POE ports and the 2 remaining uplink ports would go to your NVR and Router. EACH PORT HAS ABILITY TO PUSH 30 WATTS - TOTAL POE BUDGET IS 65 WATTS - Power even the most power hungry of POE devices such as PTZ Cameras. Each port can push up to 30 watts. Be sure to stay within the total wattage budget of 65 watts for the entire switch. UNMANAGED SWITCH - This is a typical simple plug n play unmanaged switch. If you have any questions about this product by IPCamPower, contact us by completing and submitting the form below. If you are looking for a specif part number, please include it with your message.